The Matterhorn flavored coffee is a delicious treat of Swiss chocolate flavors infused with a toasted almond undertone. Perfect for those that like chocolate and almonds, this 100% Arabica bean flavored coffee has a sweet and toasty flavor that will make your mouth melt. Named after the Matterhorn in the Swiss Alps, this coffee will take your taste buds to new heights with its deep blend of flavors. In a heat-sealed valve bag you will receive your fresh roasted coffee that is shipped on the same day, ensuring the optimal freshness in these delicious chocolate-inspired beans. 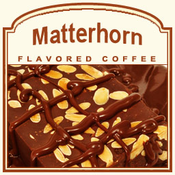 Try the Matterhorn flavored coffee for a unique tour of Switzerland!